Our newest whitepaper offers insights into the power of KPIs for the construction industry and construction accounting software, such as Acumatica Construction Edition, that provides them. You’ll learn about the benefits of implementing the right construction ERP, which can supply the KPIs you need to monitor the overall health of your organization. Key Performance Indicators (KPIs) measure how well your business is performing, alerting you to problems and opportunities within your organization. For construction companies, this insight into business performance is possible through implementing the right construction accounting software. If you download our free whitepaper, Key Performance Indicators for Construction, you’ll learn how to define and monitor the specific measures needed to improve general contractor, homebuilder, land developer, subcontractor, and specialty contracting projects and how a comprehensive construction ERP solution, such as Acumatica Construction Edition, can make it happen. This is the perfect example of why modern construction accounting software (also known as building software) is so important. With construction ERP, like our cloud-based Acumatica Construction Edition, you can manage and review your data from a single dashboard, which is accessed by any desktop computer, laptop, or mobile device with contractor apps. In our complimentary whitepaper, you’ll learn that measuring your business performance and activities through KPIs, and doing so from anywhere and at any time, is essential for your business to succeed. In Key Performance Indicators for Construction, we discuss the two different types of KPIs: historical and predictive. With historical KPIs, you’re focused on data gleaned from activities that have already occurred, and they can point out exceptions through “graphic characteristics” (more on that in the whitepaper). With predictive KPIs, you can project performance expectations geared to making decisions that will produce positive results. 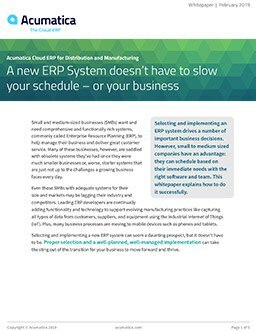 The right construction ERP system will automatically provide your specific KPIs, but you also need to make sure you’re regularly monitoring and changing your KPIs as situations are fixed and important factors shift. These changes can be easily taken care of with the flexible and adaptable dashboards and contractor apps of today; users are in control of the what, when, where, and how of KPI management. And cloud-based applications, like Acumatica Construction Edition, provide your business data in real-time – necessary for today’s fast-paced world. KPIs built in the construction ERP of your choice give you and your business the power to make informed decisions based on current data. Download your free copy of our newest whitepaper today. You’ll get the complete picture of what KPIs can do for your construction business, including the ideal number of KPIs you should be watching on a regular basis. Contact our team with any questions you may have about our new Acumatica Construction Edition. We’re excited to provide the cloud-based building software that helps you make the informed and productive decisions that will help you succeed. Take three minutes to see the highly intuitive Acumatica Construction Edition in action.